It is a cold, snowy day here in Colorado. I wanted to create a soup that was perfect for this wintery day. 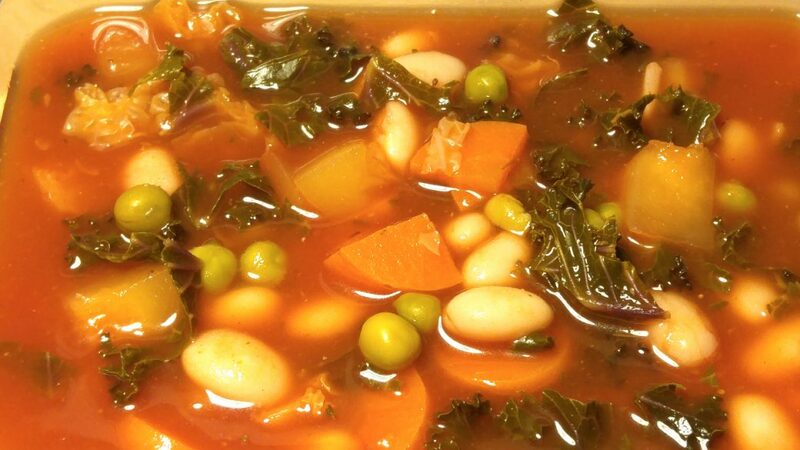 This is a variation of my Manhattan Vegetable Chowder which is my #1 favorite out of all my soups. This plant-based soup will be reminiscent of a classic clam chowder without the clams. The soup base makes an excellent starter for all of your favorite veggies. Potatoes were replaced with acorn squash but feel free to add cubed potatoes in addition or in place of the squash. Purple kale, Napa cabbage, sweet peas & carrots complete the rest of the veggies. Combine all ingredients in a medium saucepan and bring to a boil. During this time prepare your veggies. *Aquafaba is the liquid in cans of beans. A big percentage of the nutrients end up in the liquid. Add all the veggies to your boiling pot and lower the heat to medium-low. Cover and simmer for 15 mins. After 15 minutes, add the beans. Stir and simmer for 2 more minutes. This will make 4 large soup portions as a main dish or 6 small appetizer portions.